On Sunday morning, polls opened in Japan’s latest snap election for the House of Representatives, the lower house of the country’s bicameral legislature. Voting began at 7:00 a.m. local time and will end at 8:00 p.m..
Japanese Prime Minister Shinzo Abe had called a snap election in September to seek a renewed mandate amid a growing threat from North Korea—what he dubbed a “national crisis”—and general discord among the political opposition. In August and September, North Korea launched two Hwasong-12 intermediate-range ballistic missiles over Japanese territory. Moreover, North Korea has carried out multiple ballistic missile launches since last August into Japan’s exclusive economic zone in the Sea of Japan. 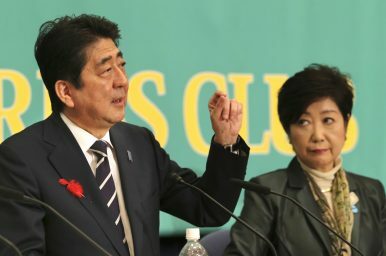 In pre-election polling, Abe and the nationally dominant Liberal Democratic Party (LDP)-Komeito coaltion appeared poised to take on a supermajority in the 465-seat House of Representatives. The LDP holds 284 seats today, with Komeito holding 34. A resounding victory for the LDP-Komeito coalition would give Abe a strong renewed mandate as prime minister amid intra-party challenges to his leadership as well. According to recent polling, the LDP alone may be on track to secure more than 300 seats. Earlier in 2017, Abe’s nationwide approval took a dip amid multiple political patronage scandals implicating him and his wife, Akie. In the lead-up to the snap election, Japan’s main opposition parties saw major restructuring as well. In Sunday’s election, the primary opposition party is the newly formed Party of Hope (Kibo No To), led by former LDP member and Tokyo Governor Yuriko Koike. Koike’s party has positioned itself as a conservative alternative to the right-wing LDP-Komeito coalition. Though Koike herself is not running, she has become the face of the opposition in the lead up to this snap election. The outcome of Sunday’s election could not only seal-in Abe’s tenure as prime minister through 2019, but it could also pave the path for the LDP to pursue revisions to Japan’s constitution—a long-stated goal of the party. In particular, amid a heightened threat from North Korea, Abe and the LDP may look to revise the pacifist Article 9 in the Japanese constitution, in which the country forever renounced war as an instrument of national policy. However, LDP politicians have long called to first revise Article 96 of the constitution, which addresses the necessary process for adopting constitutional amendments. Abe himself has supported revisions to Article 96. Editor’s Note: In a recent podcast, Tobias Harris joins The Diplomat‘s Ankit Panda to discuss Japan’s 2017 snap election.